Rub pork with oil, then season, if desired, with salt and pepper. Grill or broil, turning frequently, until pork is cooked to 145 degrees F, about 10 minutes. Remove from heat and let stand. Combine tomatoes, onion, lime juice and cilantro in small bowl, set aside. Meanwhile, prepare Knorr Menu Flavors Pasta Sides - Chipotle Rosa according to package directions, stirring in 1/2 cup salsa at end of cook time until heated through, about 1 minute. 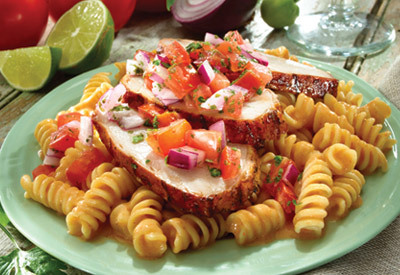 Arrange hot pasta on serving platter, then top with sliced pork and 1/2 cup salsa. Serve remaining salsa on the side. Try mixing 1 crumbled Knorr Chicken Bouillon Cube with oil, then rub on pork.